Without a competitive advantage, it's only going to get harder for Superior Energy Services, Basic Energy Services, Pioneer Energy Services, and C&J Energy Services to play in the oil patch. There's a recovery going on in America's oil patch, but it's distinctly uneven -- several oil services companies, for example, have yet to reap the benefits of the recent gains. 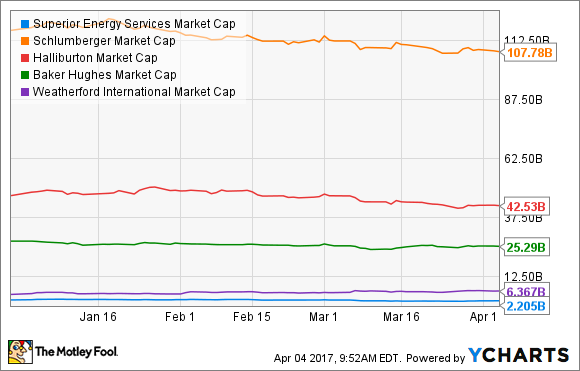 In particular, shares of four smaller players -- Superior Energy Services (NYSE:SPN), Basic Energy Services (NYSE:BAS), Pioneer Energy Services (NYSE:PES), and C&J Energy Services (NYSEMKT: CJ) -- all took more than double-digit percentage losses last month. The only thing that has been harder than being in the oil services business lately has been being a fringe player in it. This segment of the oil and gas industry is dominated by a handful of firms. Of the companies listed above, Superior is the largest. It's actually the fifth-largest diversified oilfield services provider, but the size differentials between the top four and Superior are major. As oil prices declined and producers were forced to cut back on spending, the larger players had the economies of scale and balance-sheet strength to do something that the fringe players simply couldn't: give substantial pricing concessions to producers. Those concessions in turn brought down the value of assets owned by the smaller players and, in the case of Basic and C&J Energy Services, sent them into bankruptcy. Today, we're in the middle of a recovery, but that doesn't necessarily mean great things for oil services companies yet. They all have lots of idle equipment from the downturn, and it'll cost money to get it back into working shape. In fact, Halliburton CEO Dave Lesar recently said on a conference call that this quarter's results will be severely impacted by the higher costs of bringing unused equipment back online. While Superior, Basic, Pioneer, and C&J certainly won't have to spend as much as their larger rivals, expect their outlays to be significant too. It's also worth noting that all of this idle equipment is having an impact on top-line results as well. Most of the services the companies in this space offer -- such as pressure pumping, well intervention, and contract drilling -- are fairly commoditized. There aren't many ways a company can distinguish its offerings, so the customers very much dictate contract rates. Given that, the oil services companies may be able to put some unused equipment back to work soon, but don't be surprised if margins are lower for a while. As if being a fringe player in this business wasn't hard enough before, it's about to get a lot harder thanks to consolidation at the top. Baker Hughes has announced it will join forces with General Electric's oil and gas division to create a new type of oil services company that combines services, equipment manufacturing, and big-data mining to increase efficiency. Schlumberger and Weatherford International announced they are forming a joint venture which will combine their shale drilling assets into a single entity. The purpose of that deal is likely to help the parents take on Halliburton in the oil patch, but it's likely that Superior, Basic, Pioneer, and C&J will all lose out as well. In this business, you either need to have size and scale, or you need to be able to do one thing better than everyone else to a degree that it that gives you some pricing power. None of these smaller players have either of these traits, unfortunately, which is why it's looking like they'll have a harder time gaining momentum even in the midst of this energy recovery. Unless the small fry do some consolidation among themselves, it's probably best to stay away, and stick to the big fish of the industry.